Tubing is manufactured as a straight and rigid component, and yet often is required to curve around corners or objects in order to perform its required task. To achieve this, hot or cold form tube bending is undertaken to mold the tubing to the desired shape. Tube Bending – United Metal Fabricators, Inc.
Canopies, trusses, bridges, sculptures, exercise equipment and furniture, plumbing and machinery all require angles and bends in tubing, and industries such as agricultural, construction, automotive and others all depend upon and use several lengths and diameters of tubing on a daily basis. Tubes can be bent either manually or automatically, or using a combination of both methods. Press bending is a common method in which a die in the shape of the desired bend is forced against the pipe, causing it to form the same angle as the die. Some tube bending machines use mandrels for the process of mandrel bending and to create a cleaner, more uniform bend. This is undertaken while the tubing is being formed and thus is often a hot forming process. Other machines take pre-formed tubing and force it to bend around a series of rollers, in a similar process to tube rolling, or using a die and compression handle to bend the pipe. The maximum angle at which a pipe is bent is usually 90°, although it can range greatly depending on intended use. A length of tube can be bent a single time, or multiple times if needed, but due to the lack of internal support within a tube, the bending often results in a distortion of the circle cross-section into a ovular shape. This deformation is seen more clearly on tubing with thin walls as they provide less resistance to structural change and are more prone to distortion. 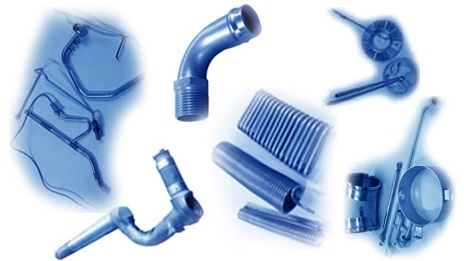 The pipe bending process, whether it is hot or cold, alters the properties of the pipe, and therefore different factors needs to be taken into consideration as part of the manufacturing decisions. The wider a pipe is, the smaller the ratio of distortion will be according to pipe capacity etc. Compression occurs within the pipe as it is bent, and this can result in wrinkles or waves on the surface of the pipe which can interfere with other processes. Bending the tubing can create areas of weakness but this is dependent on the quality of the machinery used, the complexity of the bend and the skill or experience of the workmen. Tube Bending Tube bending is the fabrication process of adjusting the angle of tubing or piping in order for it to be used in specific applications.